The Punjabis are always known to be fun-loving and full of energy, which they demonstrate through the dances, music and many other crazy forms of entertainment, in all their celebrations. Thus, their weddings are also marked with several strange traditions, which every Punjabi person feels proud of, even though these customs may even look a bit weird to other people. The Punjabis like to enjoy with a lot of people and thus, they tend to invite the whole locality to the weddings of their families; so that all of them can enjoy a blast together! There are always a few NRIs among the invited neighbors, who can bring different twist to the celebration, by adding foreign touch in it. The Punjabi weddings are marked with a huge platter of yummy Punjabi and Mughlai dishes, which are favored by most of the Punjabi people, for the rich and spicy tastes of those cuisines. There should be more non-vegetarian dishes than the number of vegetarian cuisines, as the Punjabis are mainly non-vegetarian in their food habits. 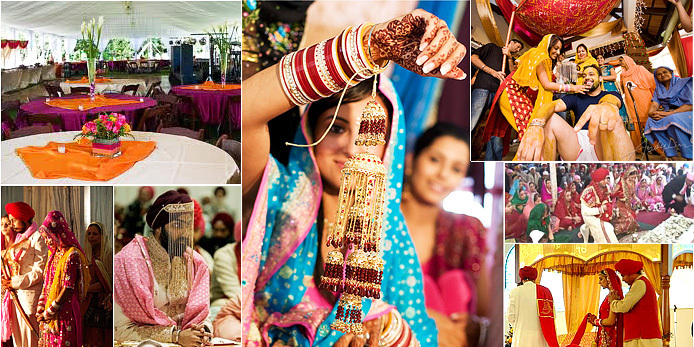 As the Punjabis are fond of feasting with everyone, the weddings give them pretty good chances for that reason. The typical Bhangra dance is a foremost part of all the rituals of the wedding celebrations; as the highly energetic Punjabis do not want to miss any chance of dancing on this joyful function. These dances are accompanied by very loud Punjabi or Hindi music, played throughout the celebration, except for the time of the marriage. Even some popular filmy songs of Bollywood are often played in weddings, on the tunes of which they can dance merrily. In rural side, the elderly women sit down with drums, which they beat happily, so that others can dance to these beats. Some women even start banging metal spoons on the metal plates, to create a lot of loud sounds, keeping with the beats of the drums. In urban areas, the band parties are called to make a great lot of din in the weddings. In urban weddings of the Punjabis, good arrangements are made for keeping different kinds of alcoholic drinks, so that the guests can drink and enjoy themselves all through the night. Some guests are often seen to be dancing, holding their glasses of wine or balancing the glasses over their heads. The aged relatives of the bride and the groom; like their grandmothers and grand aunts are seen to be dancing with the youngsters, keeping with the beats of the music with the same energy, as their young co-dancers. The groom arrives with a lot of relatives and friends; all dancing and singing happily on the road, while only the groom sits quietly over the white mare. After the marriage ceremony is over, even the bride and the groom are also seen to be dancing in some families.